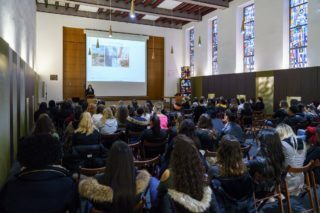 On 26 March 2018, +ImpaKT participated in the first « Fieldgen goes Circular » event at the Private School Fieldgen. Some 120 students, aged between 16 and 20 years, followed the introduction to the Circular Economy (CE) by KPMG, and were then dispatched in small groups to seven workshop where public and private stakeholders explained the practical implications of the the CE. The event was concluded by a larger conference « Food for the Future ». In our workshop we put forward the benefits of CE approaches to design out waste in the technological cycle, using electric appliances and more specifically a drilling machine as an example.